Salad set, two-pieces (2), early, with spade-shaped bowls, notched handles with rounded ends, cutouts on fork. Very nice hammering. Unusual mark. 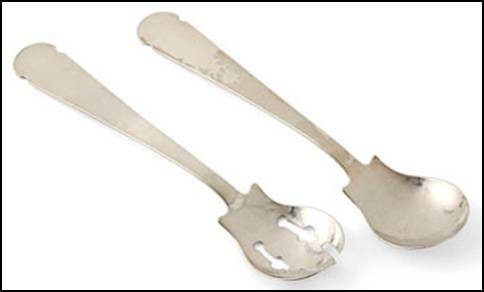 Fork: 8-3/4" L and 1-15/16" W. Spoon: 8-3/4" L and 2" W. Signed STERLING / HAND BEATEN / AT / KALO SHOPS / PARK RIDGE / ILLS. Click here to return to the Gallery index, or here or on the photo to see the next object.